Like many people that have web pages, I check my referrer logs regularly. they are using to look at your page. Here is an example below. I wondered what NET CLR 1.0.3705 represented. Internet Explorer (IE) has installed. It only appears on Windows based machines. The best post is on usenet and it describes how to change it. I decided that I would change mine and it worked. This page explains how to do it. What I am going to show you can possibly wreck your computer. Messing about with the registry in Windows not for the faint of heart. your computer, you should not be doing this. In fact, you should probably assume that it will wreck you computer. If you corrupt your computer, don't blame me. Last warning to stop with this foolish path and turn back now. Alright, don't email me with your registry problems. See the NET CLR entry? That's the one you are going to delete. 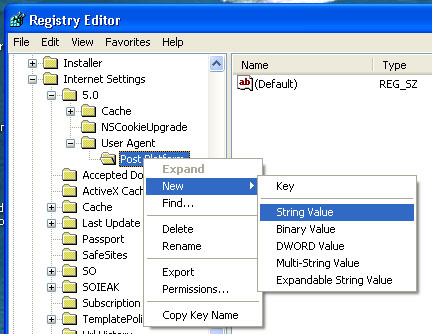 After you delete the string, you can then add what ever you want. You simply add a new string value with whatever clever text you desire. I guess you could use a URL if you really wanted. Below you can see the new entry for my computer, 'Foobar'. After doing this, I rebooted my computer. I'm not sure that you have to, but I did it anyways. I visited my own page to get a hit on the referrer logs. agent string. Pretty cool huh? Yeah, I thought so too. 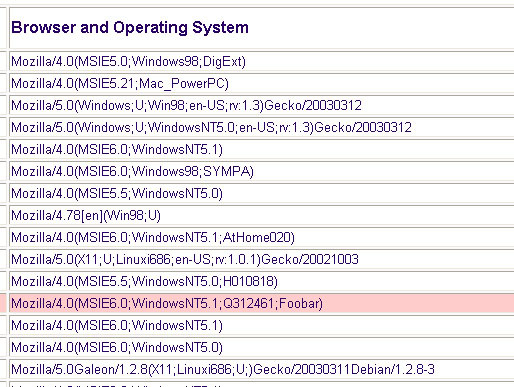 So when people check their logs, you will see 'Foobar' wherever I have been. Once again, Let me remind you NOT TO DO THIS. It's NOT MY FAULT if something goes wrong. And before you ask, yes, I use a service for my site statistics. The service is web-stat.com. The price is cheap and the service is good.